Step 1 Using a pair of kitchen shears, remove the backbone from the chicken, cutting all the way from neck to stem on either side. Step 2 In a small bowl, combine the paprika, salt, onion and garlic powder, cumin and several grinds of black pepper to make a spice blend. Step 3Place the chicken skin-side up on a cutting board, opened like a book. Press down on the center of the breast to crack the sternum to flatten the chicken. Very lightly oil the surface of the chicken, then rub the spice blend all over the chicken, massaging it over the limbs and into the skin. Flip the chicken over and repeat, very lightly oiling and then rubbing with the spice blend. 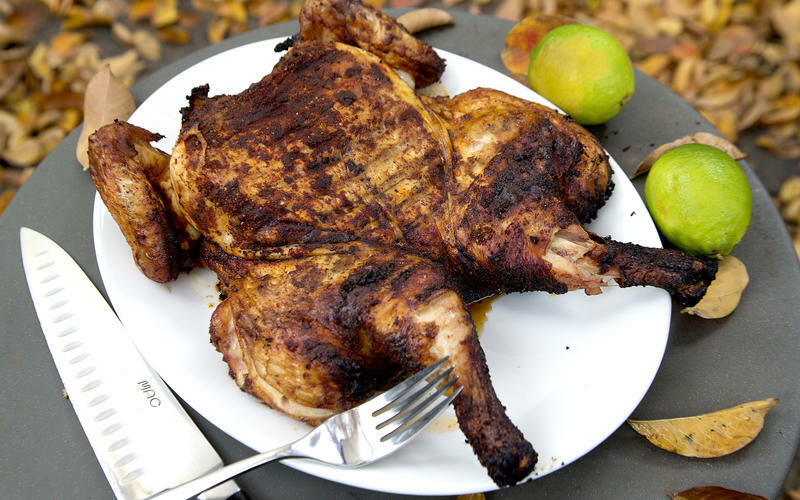 Set the chicken aside for an hour to lose the chill before grilling. Step 4Meanwhile, wrap a heavy brick or paving stone in aluminum foil, or find a heavy cast iron skillet. About 30 minutes before grilling, start coals in a chimney. Step 5When the coals are lightly coated with gray ash, empty them into the grill, arranging them against one side of the grill. Replace the grill rack and lightly oil it. Step 6Place the chicken skin-side down on the grill rack, away from the direct heat. Place the brick on top of the chicken. Step 7Grill over moderate heat (around 350 degrees) until the chicken is well-browned underneath, about 30 minutes. Remove the brick and flip the chicken over, placing it skin-side up directly over the fire. Continue cooking until the juices run clear and a thermometer inserted into the breast and thighs reaches at least 160 degrees, 10 to 15 minutes. Remove to a carving board and rest for 10 minutes before carving. In Recipes-list.com we have selected the most viewed recipes from category - Grilled Main courses . Enjoy the best recipes specially selected for you! Brick chicken is the right choice that will satisfy all your claims.